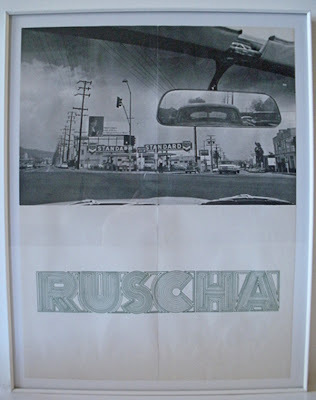 (“Ruscha”) (Double Standard). Los Angeles: Ferus Gallery, 1964. Lithograph in black and green ink on white paper. 13 x 10”. Folded as issued. This is the vintage exhibition poster commemorating Ed Ruscha’s second one-person exhibition that opened at Ferus on October 20th, 1964 and where Ruscha originally exhibited his paintings of gasoline stations for the first time. This printing constitutes the original reception context for his friend, Dennis Hopper’s now infamous 1961 photograph taken through a windshield at the intersection of Santa Monica and Melrose: it captures a pit stop to which Ruscha would return again: a Standard Station and its doubled signs. A billboard over the gasoline station reads: “Smart Women Cook with Gas in Balanced Power Homes,” slyly eliding Ruscha’s own interest in signs, wordplay, gasoline stations, and small fires evident in his then-recent works. The photographic image is juxtaposed not with the quotidian details of the exhibition’s place and time, but simply with the loud signal of an early Op-like typeface, honking the artist’s name in green ink: “RUSCHA”. Although Dennis Hopper’s photographs were incorporated into several Ferus Gallery exhibition poster contexts, this one—whose vantage and subject dovetails so closely with the young Ruscha’s own aims—was both a familiar and uncanny choice. “The Double Standard photograph of mine,” Hopper recalled, “which I took in 1961 was Ed’s announcement for his 1964 show (at Ferus) of paintings of Standard gas stations, one of which I bought, I think, for $780.” That the double boomerang of Hopper and Ruscha’s photographic readymades depicting urban scrawl — gasoline stations, billboards/signs, wordplay, font-play, and more — finds cross-pollination in this particular and original ephemeral context is a combustible elixir of Los Angeles car, cool, fame, and flame. This perplexing publication is the authentic 1964 issue, printed in its vintage strike. Very good condition. With no pinholes or time staining. Not to be confused with the different printed context of Ace Gallery’s re-issue of Hopper’s negatives as over-sized, boutique art photographs in 2006.